More than three weeks after Mashable’s most recent Social Good Summit – an annual gathering of progressive thought leaders and global citizens in New York – the conversations we heard and took part in are still giving us something to think about. 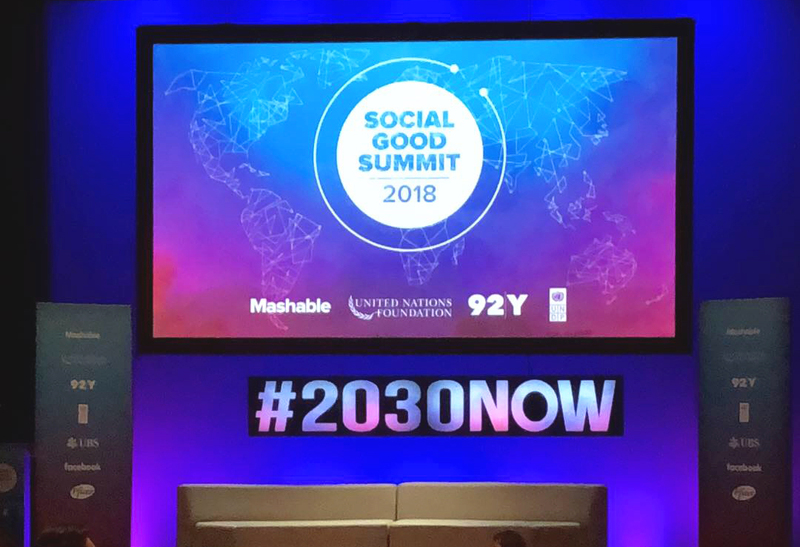 This year’s summit – held at the storied 92nd Street Y during last month’s United Nations General Assembly week – focused on the theme “#2030NOW.” Speakers from around the world looked ahead to the year 2030, envisioning futures that we might aspire toward and assessing our progress as it stands. They shared frank assessments of the immense work that still needs to be done for humanity to reach our full potential, but they also shared inspiring stories about the progress we’re already making, not just as a society but as a species. Over the course of the event, we heard leaders in business, government, media, culture and more discuss all of the ways we can – and are already beginning to – unlock previously untapped potential and foster growth using innovative technology and new media. They spoke about solving problems as wide-ranging as homelessness, plastic pollution and the lack of women in the tech industry. But again and again, we were reminded of one common theme: We have the tools to make the world a better place. 1. Healthy societies value alternative perspectives. Throughout history, major societal decisions have often been made by relatively small groups of individuals. Participating in a panel alongside the UN Secretary-General’s Envoy on Youth Jayathma Wickramanayake, YouTuber Lilly Singh advocated against one iteration of this well-established dynamic: “No decision about or for youth should be made without the input of youth.” Singh and Wickramanayake went on to note that adults tend to believe they know more and therefore that they know better than the youth, but that young adults are in fact actively leading some of the most transformative social movements today. Ultimately, the perspectives and insights of progressively minded young adults – whether they’re the UN youth leaders at the summit or the student gun control activists who arose after the Parkland shooting – are invaluable in our larger efforts to elicit positive social change. This sentiment of giving a voice to those that are sometimes overlooked was echoed throughout the summit in different forms. Whether it’s bringing more women into STEM fields or making a greater effort to seriously consider the needs of non-human species in our plans for the environment, we must do everything in our power to recognize all voices and allow them a platform to be heard. 2. Technology can be a powerful driver of equality and empowerment. Empowerment comes in many forms, but for many people throughout the world, simply having access to a cell phone can be life changing. Zuriel Oduwole, a young filmmaker, illustrated this point powerfully at the summit. During her presentation, she first had the audience confront their own attachment to their mobile devices by asking every woman in the audience to pass her phone to a nearby man and allow him to delete her data. Once the laughs and incredulous remarks had subsided, Oduwole began exploring why we felt so attached to our phones – not just because they’re important communication devices, but because of the unparalleled access that they grant us, both to an immense wealth of information and to each other. She then went on to share a film on what owning a mobile phone means for women in disadvantaged communities throughout the world. In it, she demonstrated the independence and autonomy that a mobile phone grants – serving not only as a communications device but as an invaluable resource for learning and for managing life independently. We often take these functionalities for granted, but they have the power to be truly transformational in ensuring global equality. 3. Brands have immense power to address social problems. While no single country or corporation has the power to single-handedly correct every social ill, brands that work together can be a powerful source for good. One example from the communications and advertising sector: Earlier this year, the United Nations Development Programme, FINCH and Mars, Incorporated together announced a new initiative called “The Lion’s Share,” which asks advertisers to donate 0.5 percent of their budget for any advertisement they make featuring an animal. The percentage may seem small, but in a billion-dollar industry, this small contribution can have a significant impact. For our team, the Mashable Social Good Summit was an excellent opportunity to regain perspective and renew our commitment to using communications to drive social good. Now, we’re already looking ahead at how to apply these learnings to empower both our clients and our colleagues to drive greater impact themselves, and continue to be active participants in shaping the future. What future do you envision for 2030, and what can you do now to help get us there?